It took me a long time to warm up to making a project for the 2014 Pantone Quilt Challenge – I didn’t have many purples in my stash, even fewer of them in that sort of reddish-pinky-purple that Radiant Orchid seems to be, and I just didn’t have any ideas. But then I read a blog post at Mary Corbet’s Needle ‘N Thread that introduced me to the hand over-dyed threads produced by Colour Complements. Mary was running a giveaway for threads from their Etsy shop and I got sucked into thread heaven, a place filled with pretty, pretty cotton and rayon, and I forgot the giveaway entirely: I just had to buy some thread immediately. I paired up my sampler pack of threads (three sizes of perle cotton, a rayon chainette, and another very fine rayon thread) with three shades of Kaffee Fassett shot-cotton – Grape, Granite, and Lilac. I choose very quiet fabrics because I wanted to try out something called Kantha quilting and I wanted the stitching to pop, rather than blend into a busy print background. Kantha is a type of embroidery used in parts of India and Bangladesh to give new life to old saris – women would stack up several layers of old, worn saris and stitch them together using a running stitch which could be done in long straight lines or could used to create patterns or pictures. Most of the newer kantha quilts I’ve seen are done exclusively with the running stitches running across the quilts with little extra decoration, but if you do a Google image search or even go to Wikipedia, you can see pictures of some of the more decorative patterns that can be made with Kantha quilting. I did a little bit of both types, I suppose, since I did largely just straight lines, but also interrupted myself to include a very literal interpretation of the Radiant Orchid challenge. (So literal that I also brought an orchid home so that I could do a triple orchid take – plant, representation of the plant, colour named after the plant.) Because I was working with a sampler pack of threads, I had a little of a lot of varieties of thread, but not a lot of any of them, so I did five repeating rows of (six) different threads, which I also hoped would give it a nice texture and maybe kind of draw the eye around with the different shades of purple and pink (and little splashes of gold) . I stitched the whole thing without a hoop or pins or anything – it was small enough it didn’t feel like it needed much support to keep it together, though I did start with the rayon thread and stitch it every 1-inch or so to help stabilize it enough that I really really didn’t have to worry. I was surprised by how much (overall) I enjoyed the process of stitching – it felt like it should have been tedious, but I didn’t get tired of it until I was near the end and using the worst of the threads – a 100% polyester (which feels scratchy and horrible) and the very thick perle cottons, which my needle was resistant to threading and which then didn’t want to take more than a single stitch at a time. The sparkle chainette (the one with gold flecks) was also a bit difficult because it was incredibly stretchy: I started with a piece of thread the width of the cloth and somehow managed to stitch TWO full lines without starting another length of the stuff. I free-hand stitched the orchids following a tutorial from Drago Art. For the flowers, I used another variegated perle cotton, this one in a blue-green-purple blend, but I found it sunk back into the background too much, so I outlined a lot of it with a very pale lavender DMC floss. Unlike the rest of the stitches in the piece, that back stitch does NOT travel to the back of the quilt – it’s all on the surface. A third thread was used to stitch the stem – it’s maybe a little too bright, but I like it anyway, so we’ll pretend I didn’t say that. Anyway, this project absorbed a lot of my time throughout the first couple weeks in March, so much so that I feel like I should be sick of it now, but I’m pretty proud of how it all came out. It kind of dresses up that weird little nook in the strairwell/kitchen along with that print of one of Rodin’s Cambodian dancers and the actual orchids. My sister will likely hate the purple, so it won’t last there too long, I don’t imagine, but eventually it’ll go dress up my Mum’s house for spring. This was finished on 17 March 2014 and stitched entirely by hand, by me. The binding was sewn to the front and hand-stitched to the back. The fabrics are all Kaffee Fassett shot cottons: the binding is “Grape,” the front is “Granite” and the back is “Lilac.” The threads are all from Colour Complements, except for one shiny purple one (directly above the gold flecked rayon) and the orchid outline, which are both DMC, though one is cotton and the other a horrible, scratchy Polyester. (Seriously, I don’t recommend it.) The quilt measures 15.5″ x 19″ and it is nameless, as are most of my quilts. This was also my Lovely Year of Finishes Goal for March (goal post here), so success on all fronts! Categories: A Lovely Year of Finishes, Decor Items, Embroidery & Needlework, Finished Objects, Quilts - Mini | Tags: 2014, 2014 pantone quilt challenge, a lovely year of finishes, challenge, crossweave fabric, embroidery, embroidery floss, finish it up, Finished Projects, handquilting, kaffe fassett, mini quilt, Pantone Quilt Challenge, perle cotton, rayon thread, shot cotton, stitching, wall-hanging | Permalink. For the 30/30 Sewing Challenge, I’ve been working on my Pantone Quilt Challenge project. These pictures are quite old – there’s a whole lot more done than I’m showing here, but all the other pictures I’ve got are Instagram photos – and since taking this picture, I’ve made use of all the threads in this picture, as well as one new one that I had to buy because I ran out of a couple of these. (Sampler packs are brilliant for getting some of a lot of different threads, but not so brilliant when you want to make extensive use of them!) All these threads came from Colour Complements and were one of the sampler packs. I’m really enjoying working with these (except for the sparkle chainette, which I have been using stitched through fabric, but which is too stretchy really to be a good stitching choice. I went and checked out Lorraine’s blog today for more information about it and she doesn’t recommend stitching with it, but using for surface decoration, like weaving through other stitches. It doesn’t surprise me! I’m using a layer cake of Basic Grey’s Eva line, which came out several years ago. I’ve had this layer cake (and a charm pack) sitting around in my sewing room for a long, long time and since I had enough of that white fabric in the background to cut up into 10″ squares for these blocks… I thought Why not? It felt like a good time to use that pretty fabric. Best to do it before I someday stop liking it, right? I’m really enjoying the process of making these blocks. I’m going to get the next set done today or tomorrow and can’t wait to add to the little pile of finished blocks. Love these things! 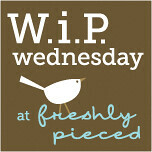 Categories: Embroidery & Needlework, UFOs and WIPs, Work In Progress Wednesday | Tags: 2014 pantone quilt challenge, basic grey, BasicGrey, kaffe fassett, layer cake sampler qal, Moda Bella cotton, shot cotton, WIP Wednesday, work in progress wednesday, work-in-progress | Permalink. Naturally because I have a bit of a goal list for the month, I’ve so far only worked on completely different things. Two of them totally new! The simplest thing on my ginormous To-Do list was to add borders to two finished baby sized tops and send them away for a Linus group to quilt and gift to a child in need. I even had the borders cut. Sure, the lighting is horrible. But so are the borders! I don’t hate all borders on sight (like some capital-m Modern Quilters seem to), but there’s a time and a place for all things, and these two quilts were not the place for borders, apparently. Thing was, they weren’t very square and if you have a not-very-square quilt, adding properly sized borders can really help fix a multitude of sins. But they’re just so awful looking! I couldn’t decide if I should take them off or leave them on, and I left them in the end. I figure if the Linus group that gets them really hates them as much as me, they can trim off 2.25″ width to use as binding fabric (and be left with a skinnier border, that maybe wouldn’t look so bad?) or they can rip them off entirely or they can leave them on because maybe some kid somewhere will appreciate it anyway. An embroidered monkey stuffie from Kiriki Press. They sell a sweet little collection of embroidered stuffie kits. This is one of the simplest ones – you only need to know chain stitch and running or back stitch to do the embroidery. I picked it up because I thought it was cute and because Kiriki is an independant Canadian company (and I want to support Canadian talent) and did I mention it’s cute? I’ve only been working on it a little here and there while watching tv, but then I haven’t watched anything in a few days now, so I’ve set him aside again. I’m determined to finish him this month, though, so to that end, I’m going to link up to &Stitches January finish-along. I have lots of other embroidery projects I could try to finish instead, but I’m feeling this one instead. I’m also working on some pot-holders out of that Christmas fabric I mentioned a couple days ago. I started out following a pot holder/hot pad tutorial, but I got distracted somewhere along the line and sort of did my own thing and then I thought how very boring it was (just this floral fabric on the front/heat reflective side, all that brown background fabric on the back side) so my brain went back to that original tutorial and thought I’d better add some kind of embellishment to break up the front a little. So today I headed over to Fabricland and picked up a half metre each of those two crochet lace edgings – grand total of $1.13 – to test against the fabric. Neither matches quite exactly – in brighter lighting, the white is a much purer white than the fabric, which is a creamy yellow-based white and the beige is much too dark. (The beige does match the twill tape loops quite well.) But I have enough to do four hot pads, so I think I might just do two with the white and two with the beige and be done with it whether they match precisely or not. Categories: Embroidery & Needlework, Fabric Fast/Finish It Up, Quilts - Baby, UFOs and WIPs, Work In Progress Wednesday | Tags: 2014, baby quilt, batik, donated quilt, donations, embroidery, finish it up, Finished Projects, hot pad, kiriki press, money, potholder, quilt top, quilting, Scrappy Trip Around the World, sewing, stitching, stuffed toys, WIP Wednesday, work in progress wednesday, work-in-progress | Permalink. Sometimes I get a little… weird about how little I finish in a year. Or maybe just how few big things I finish in a year. I read a lot of blogs (like… a lot), and some people seem constantly to be producing New! Amazing! Gorgeous! things every time I turn around, and it’s just not the way I work. But I still occasionally get all wibbly about it, as if it matters or as if anyone cares or as if the Quilt Police are keeping count and will take away my crafter card for not being that prolific. 3. To finish quilting the seven quilt tops in my closet – Well…. one down, six to go. 4. Don’t start anything new, except some wall-hangings for my mom – AHAHAAHAHAHAHA. 5. Work on some of my unfinished projects – See above. And five embroidery goals, of which I did exactly none. Quilt blocks. A lot of quilt blocks. Not all of the quilt blocks though. There were more churn dashes I made for my own quilt that I didn’t photograph. And then all the blocks that went into a quilt top I haven’t photographed yet (for the Confetti Go Lucky quilt) and more of the Cat Face blocks, which I didn’t photograph. The Doctor Who ones probably shouldn’t be in there because I’ve made them into a quilt top, which just needs its last border, but I don’t have any photos of the completed top, so I put them all in here. So that’s all of 2013. More or less. Next post… plans for 2014. I think I’ll make a combination Fabric Fast/WIP list/Another Lovely Year of Finishes/2014 Goals post. Else it might be the longest lead into 2014 EVER. Categories: Decor Items, Embroidery & Needlework, Finished Objects, Random Stuff, Small Sewn Items, UFOs and WIPs | Tags: a year in review, Finished Projects, lookback, quilting, review, sewing, work-in-progress | Permalink. This is a double whammy post – both my current Work in Progress for both the WIP Wednesday link ups (With Lee of Freshly Pieced and Needle and Thread Network for Canadian bloggers) AND for the September goal post link up for A Lovely Year of Finishes. I didn’t finish my August goal – to finish my Doctor Who quilt top – so I’m adjusting it to my September goal (and expanding on it slightly). My August goal was to get the top put together, and I nearly made it – I got all the blocks sashed and pieced together and I got the inner border attached, but I stalled out on the outer border. You can see a part of it in the photo – it’s the wide band of the light blue fabric on the far left. I’m piecing in some words on two sides of the border, so I need to get those words put together before I can really finish the top. I was started on the words, but my parents came to town last week and we went on our little mini-trip and that kind of sucked up the hours I might have spent finishing it in August. This photo does NOT feature the fabric I bought with that giftcard – it’s still got to be cut, packaged, shipped, etc! But this fabric was my starting point. I wanted to pick up interfacing for the bag, so on the weekend I went to Fabricland, which is a fabric chain that sells all sorts of varieties of fabrics, but has a pretty poor quilting cotton selection. They have a fairly large one, at least at the store nearest me, but most of the fabric isn’t very good quality. And then every now and again you’ll find something quality that you recognize – in this case, it was this poppy print from Laura Gunn’s poppy collection for Michael Miller. (One of my unquilted but otherwise finished quilt tops is done in this line of fabric; it’s definitely a favourite line of mine, even after all these years.) This particular print appeals to several different parts of me. It lets me have a fairly neutral bag – the bottom part of the bag will be in Essex Linen in Denim (so long as it matches… that fabric is en route too) – but one with a pretty print and a few little splashes of colour. It’ll let me have a kind of wild lining, which is something I love, via Laura Gunn’s rust stripe print from that same fabric line (also en route, or will be once the seller lists my reserved listing and I can buy it). I pulled open and read through the instructions for the Birdie Sling and it sounds pretty doable. I think even I can do it, and I’m not always that great with patterns for things like this. It’s less intimidating than most of the patterns in Amy Butler’s book of baby patterns, at least, so that’s something! Categories: Embroidery & Needlework, Fabric Friday, Quilt Blocks, Small Sewn Items, Stitch-A-Longs, UFOs and WIPs | Tags: a year of lovely finishes, Amy Butler, birdie sling, doctor who, doctor who stitch-along, dwsal, embroidery, laura gunn, poppy, quilting, sewing, stitch-a-long, tote bag, WIP Wednesday, work in progress wednesday, work-in-progress | Permalink.